Join us after the season to celebrate the 2018-19 wrestling season with the BAWA Awards Banquet on Sunday, March 31st at Morningstar Fellowship from 4:30 to 7:30 PM. Dinner will be provided! Check the link below for all details and RSVP by March 17th! The next BAWA meeting is scheduled for Monday, April 8th at 7:00 PM at the Boyertown Ambulance building. Please consider attending if you'd like to be involved with helping Boyertown wrestling! Based out of Boyertown, the Arsenal Wrestling Club is open to wrestlers in grades 3 through 9 with no HS experience. Wrestlers from all school districts are welcome too! The 2018-19 scholastic wrestling season officially came to a close on Saturday night in Hershey with the PIAA Class AAA Championships medal round. 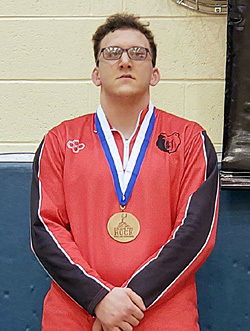 For the seventh year in a row, a Boyertown wrestler brought home some hardware. This time it was sophomore Julien Maldonado who placed 8th at 106 pounds to earn his first state medal. Maldonado is the fifth BASH wrestler to place at states as a sophomore. He started his first trip to states with a first period pin to advance to the quarterfinals, where he'd fall (by pin) to drop into the consolations. There, he needed to win against Keanu Manuel from Downingtown East in order to guarantee a spot on the podium. He beat Manuel for third at the regional tournament, and defeated him again (this time 1-0) to earn that first state medal. He would fall to another District 1 wrestler (Kyle Hauserman of Council Rock North) in the next round of consolations to put him in the seventh place match. He would forfeit that bout due to a minor injury to claim eighth place. Maldonado finished his sophomore campaign with a record of 37-16 and now has a career mark of 67-27. Seniors Brett Breidor (152) and Jacob Miller (195) and junior Evan Mortimer (160) were also in Hershey but fell shy of medaling. Breidor and Miller each went 1-2 while Mortimer went 0-2. Breidor's career ends with a record of 74-53. Miller's career finished with a record of 108-44 to put him 28th on the career wins list at Boyertown. He qualified for states twice. Mortimer closed out his junior season with a career mark of 74-51, having reached states twice. 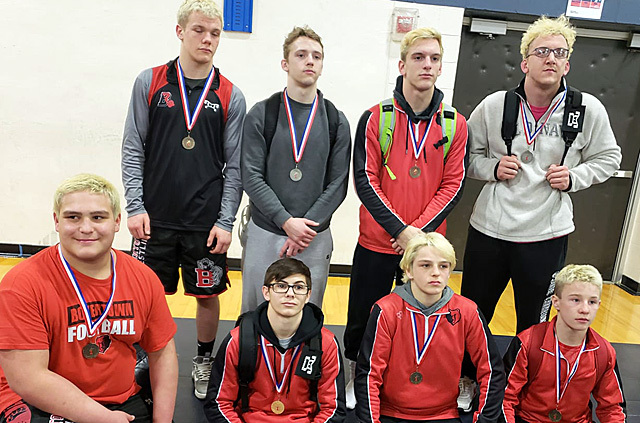 Boyertown had eight wrestlers competing in the 2019 PIAA South East AAA regional tournament at Souderton HS. The tournament was one of the toughest in a long time, thanks in part due to the full 16-man brackets in each weight class. Place in the top five and you earned a trip to Hershey for the state tournament. When it was all over, four Bears punched their tickets to Chocolatetown and the team finished in fourth place out of the 57 in the field. Senior Jacob Miller earned his second trip to states by winning his first regional title at 195 pounds. He went 4-0 in the tournament with a pin and three decisions against top-notch opponents. Sophomore Julien Maldonado finished in third place at 106 pounds. He lost to the eventual runner-up in the quarters, and then stormed through the consolations with three first period pins (plus another in the prelims) before winning the third place match 4-1. Junior Evan Mortimer returns to states for the second year in a row as he placed 4th at 160. He dropped to the consolations after a tough prelim match on Friday night but rebounded to win four straight to get to the consolation final. Senior Brett Breidor won his prelim at 152 but lost in the quarters to send him to the consolation bracket. He won two straight before falling in the consolation semis setting up "must win" match against the opponent who pinned him in the quarters. He responded in dominant fashion, taking fifth with a 16-1 technical fall. Freshmen Kade Davidheiser (1-2 at 113), Chance Babb (1-2 at 120), and Alan Alexander (1-2 at 170) along with sophomore Robert Terra (0-2 at 285) each saw their seasons come to an end. District 1's new AAA post-season features just two weekend's of tournaments before states, instead of the traditional three. The Bears did pretty well in the first tournament, the District 1 AAA Section North tournament held at Pottstown HS. As a team, they placed 2nd in the 14-team field behind only PAC rival Spring-Ford. Individually, eight Bears placed in the top four in their weight to advance to the South East AAA regional at Souderton on March 1st and 2nd. 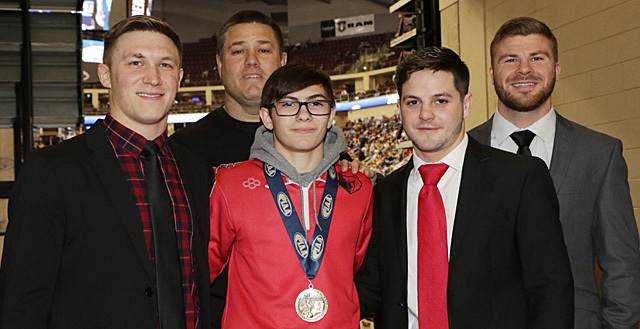 At 106, Julien Maldonado was the lone Boyertown wrestler to capture a gold medal as he went 3-0 in the tournament (two pins and an injury forfeit). Brett Breidor (152) and Jacob Miller (195) made it to the finals but lost to place second. Breidor had a major and a tech fall to reach the finals while Miller had two falls. Four Bears placed third at the tournament - Kade Davidheiser (113), Chance Babb (120), Evan Mortimer (160), and Alan Alexander (170). Robert Terra (285) rounds out the regional qualifiers with his fourth place finish. Three more Bears placed fifth or sixth in matches used to determine alternates for the regional tournament. Noah Fisher (138) and Jacob Sonder (220) took fifth while Dominic Sheridan placed sixth at 126. The tournament was the final action of the season for six members of the team. Freshmen Sheridan and Nicholas Montanye (132), sophomore Jimmy Sinclair (182) and junior Fisher all concluded their seasons, while seniors Connor Neiswender (145) and Sonder saw their high school careers come to an end. Qualifying for the state duals is difficult, but winning matches once in the tournament is even harder. 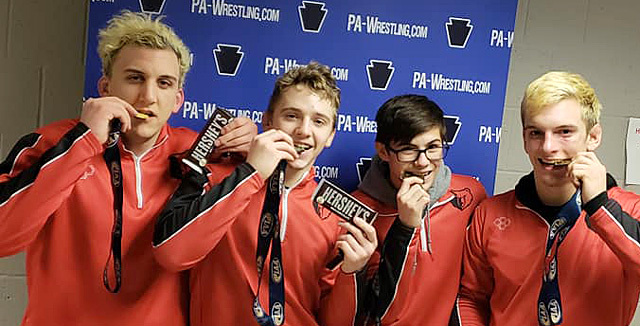 The Bears found that out on Thursday and Friday when they went 0-2 to get eliminated from the 2019 PIAA Class AAA Duals tournament in Hershey. In the opening round the Bears faced off against District 11 champ and returning state champions from Bethlehem Catholic, falling 57-9. The Golden Hawks would go on to win their third title in four years on Saturday. 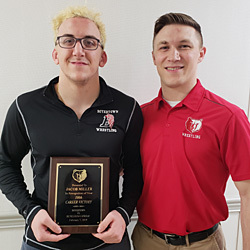 Boyertown got just two victories in the match, a forfeit to Logan Huls at 195 and Jacob Miller's 5-3 decision at 220 which was his 100th career victory (see story below). In the consolation round, the Bears' opponent was District 6 champion Mifflin County. The Huskies jumped out to a 24-3 lead and the Bears just couldn't quite make up that ground in a 39-24 loss. Earning wins in that dual were Kade Davidheiser (113), Brett Breidor (152), Evan Mortimer (170), Alan Alexander (182), Jimmy Sinclair (195), and Miller (220). 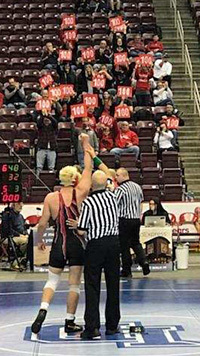 On February 7th at the Giant Center in Hershey, senior Jacob Miller earn career victory number 100 in the opening round of the state duals against Bethlehem Catholic. His 5-3 decision over the Hawks' Jarius Rosado pushed his career record to 100-41. Miller is the 33rd wrestler in BASH history to get to the 100 win mark. He would add a win the next day to jump ahead of 2017 grad Matt Wilde to move into 32nd place on the schools' career wins list. Over the last few weeks of his high school career, Miller will look to add a few more wins to his record as he tries to qualify for states for the second time. Congrats Jake! This is becoming a busy week for the Bears wrestling team. 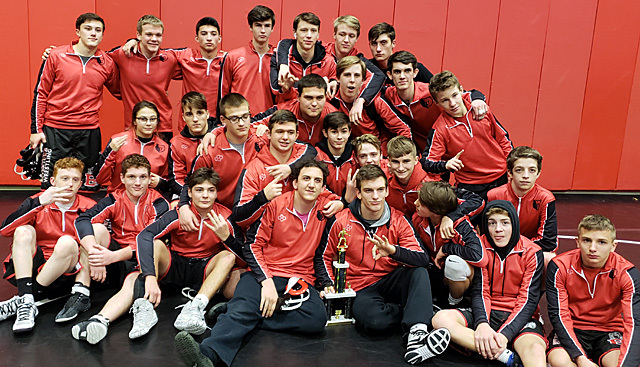 On Monday night they traveled to Archbishop Ryan HS in Philadelphia for a PIAA Class AAA State Duals prelim match with the Raiders, with the winner earning a spot in the 16-team bracket in Hershey starting Thursday. The team made the trip well worth it as they won eleven of the 14 bouts in a 55-16 victory. The Bears opened with four straight wins (including three pins) by Connor Neiswender, Brett Breidor, Evan Mortimer, and Alan Alexander. After Ryan got on the board, the Bears took complete control of the match when they took the next seven bouts. In that run, Jacob Miller, Jacob Sonder, Robert Terra, Kade Davidheiser, Julian Maldonado, Chance Babb, and Nicholas Montanye all had wins. Then on Tuesday night in a quick turnaround for the team, they hosted Norristown for their final home and final PAC dual of the season. It also Senior Night as the program honored the six senior wrestlers (Broc Babb, Brett Breidor, Logan Huls, Jacob Miller, Connor Neiswender, and Jacob Sonder) and two senior managers (Mackenzie Haley and Erin Wilde). The match was dominated by a bunch of Bear falls with Maldonado, Davidheiser, Chance Babb, Broc Babb, Breidor, and Mortimer all winning by fall. Also scoring wins were Dominic Sheridan and Evan Detwiler by decision and Jacob Miller by injury default the 48-22 win. The Bears were seeded fifth in this year's District 1 AAA Duals field of 16 teams. With the top four teams advancing to the state duals bracket, the goal for the team was simple. Do better than the seeding. After a dominating opening round victory over Souderton (67-12), the Bears made it to the quarterfinals where they faced the four-seed West Chester Henderson. The Bears flexed their muscle in a 43-21 victory over the Warriors to advance to the semifinals. In the semis, the team faced a powerful Council Rock South team who would go on to claim their third title in a row. In the consolation semis against six-seeded Garnet Valley, the Bears needed a win to clinch a spot in the state duals for the seventh season in a row. They got that win with a big 38-25 victory over the Jaguars to setup a rematch with PAC rival Owen J. Roberts in the third place match. The Wildcats got the best of the Bears again in that one, winning 41-26, but it didn't matter as the Bears already knew they would continue their post-season run as a team. The Escape the Rock tournament held at Council Rock South HS has become one of the toughest tournaments not just in PA but in the entire country. Despite the weather knocking a few teams out of the field, it still lived up to its lofty expectations again this season. Senior Jacob Miller was the only Bear wrestler to make it to the second day of the tournament, placing fourth at 195 pounds. Miller, seeded third, won his two matches on Saturday to advance to Sunday morning's semifinal round against the second seed from Cincinnati LaSalle. Jacob dropped that bout 5-2 but rebounded with a third period fall in the consolation semis to advance to the consolation final, where he dropped an 8-0 major. He now has two medals from ETR, as he finished eighth last season. Two Bears got to the final round of consolations on Saturday but were eliminated. Julien Maldonado (106) and Jacob Sonder (220) fell just a match short of making it to day two. Maldonado went 2-2 in the tournament while Sonder went 0-2. As a team, the Bears finished 30th out of 49 teams. The high school team suffered their second straight PAC Liberty defeat on Wednesday night, this time at the hands of the Spring-Ford Rams 44-15. The Rams came into the night ranked 2nd in District 1 and they showed it. They won the first three bouts of the night to take a 15-0 lead before Kade Davidheiser got the Bears on the board with an 8-6 decision at 106 pounds. The Rams then took the next three bouts to run their lead to 27-3 before Dominic Sheridan scored an 8-4 decision at 132. Spring-Ford earned bonus points in the next two bouts before the Bears finally strung together a few wins in a row. At 152, Brett Breidor won 4-3, followed by Preston Fox's 5-4 win at 160, and then Alan Alexander won 13-7 at 170. The Rams won by fall in the final bout to close out the 44-15 win. The first big PAC wrestling match of the season was held at Boyertown last Wednesday evening when the Owen J. Roberts Wildcats came to town. When these two teams get together, it's always a great match and Wednesday's was no exception. The match started at 182 pounds, and the Bears took the early advantage with Jimmy Sinclair scoring a big 3-1 victory to put the Bears on the board. Anthony Bauer battled at 195 before getting pinned to give OJR the lead before the Bears ran off three straight pins. At 220, Jacob Sonder scored a fall in 5:27 and then Robert Terra (59 seconds at 285) and Kade Davidheiser (57 seconds at 106) each pinned in under a minute. That set the score at 21-6 Bears. At 113, Julien Maldonado had a lead over his Wildcat opponent before getting pinned to give OJR some life. OJR followed up with a 6-1 decision to get closer at 21-15. Nicholas Montanye got the Bears got on the scoreboard with a 3-1 decision at 126 to set the score at 24-15. The Wildcats flexed their muscle in the final six bouts, winning all six including three pins and a technical fall to finish off the dual meet. The final score was 44-24 OJR. The loss drops the Bears overall record to 9-5 overall and 1-1 in the PAC Liberty. On Friday and Saturday, the Bears headed up to the Lehigh Valley for two matches on Friday evening and five more on Saturday at the Parkland Duals. The team split the matches Friday beating Delaware Valley (44-18) and falling to Saucon Valley (40-20). Saturday at the Parkland Duals, the team started with a tough opponent in District 11 powerhouse Northampton. The Konkrete Kids dominated the match winning 64-9. The Bears rebounded with a 64-12 win over Central HS from Philly then a 60-21 win over Mariana Bracetti Academy before defeating the host Trojans 51-18. The final match Saturday was with District 3 power Cumberland Valley. The Bears opened with three straight wins before CV ran off six straight wins to take a 32-18 lead. The Bears won four the last five bouts but fell just short on the scoreboard with a 38-36 loss. 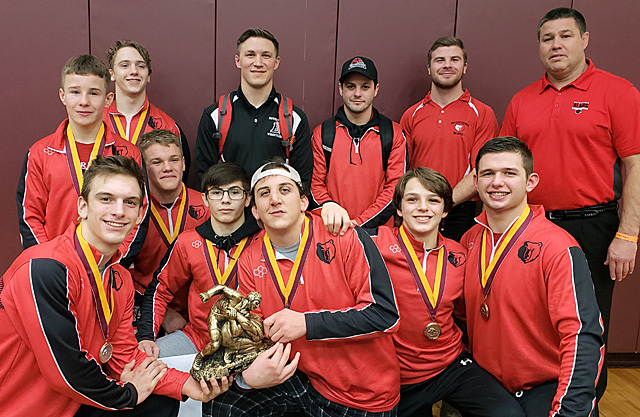 For many years, the Boyertown wrestling team participated in the Governor Mifflin Mustang Holiday tournament. After a 10 year hiatus from the tourney, the Bears returned to the tournament last year and took 3rd place as a team. This year, the team claimed the tournament championship for the first time since 2006 (the last year before the hiatus). Overall, eight Bears placed in the top eight led by sophomore Julian Maldonado's gold medal. Maldonado went 4-0 for the tournament at 106 pounds, getting to the finals with two pins and a technical fall in the semis. In the finals he scored his first Mifflin title with a 4-3 decision. Seniors Brett Breidor and Jacob Miller as well as junior Evan Mortimer also made it to the finals but all had to settle for second. Breidor (152) had three falls to get to the finals, Mortimer (160) scored two technical falls and a major on his trip to the finals, and Miller (195) had two pins and a major. Freshman Alan Alexander had a nice tournament at 170 to place third as he won his first match by major before dropping his quarterfinal match and then running off four straight wins to medal. Freshman Chance Babb (120) and senior Jacob Sonder (285) each placed fourth. Both went 4-2 during the two-day event. Freshman Kade Davidheiser placed 8th at 113 to round out the Boyertown medalists, going 2-3 for the tournament. Dominic Sheridan (132), Logan Huls (182), and Robert Terra (285) each fell just a win shy of medaling in the 24-team field. On Wednesday evening, January 9th, prior to the big PAC rivalry matchup with Owen J. Roberts, four individuals will be inducted into the Boyertown Wrestling Hall of Fame. The newest members of this exclusive club are Troy Eagle, Diane Heffner, Matt Malfaro, and Ralph Reish. Eagle is a 1979 Boyertown graduate and was a regional qualifier as a senior. As a coach, he led the JH East team as head coach for 12 seasons (108-24 record) and was an assistant coach at the youth level for some time as well. Heffner has been a mainstay around the Boyertown wrestling program for two decades. She has been involved in everything from running concession stands to being a board member of both the youth club and BAWA, including being the President of both clubs. Her tireless work ethic is second to none in all of her volunteering. Malfaro graduated from Boyertown in 2010 and finished his illustrious high school career with a record of 149-42, including 59 pins. At the time of his graduation he was 2nd all-time for wins by a BASH wrestler. He was a 2-time section champ (4-time finalist), 3-time district champ, a regional champ (3-time regional finalist), and a 3-time state qualifier with a 7th place finish as a senior. Reish has served a coach in some capacity for nearly 30 years in the Boyertown program. He was a coach in the youth club for 15 years and at the high school level for 13 years. He also spent a few years coaching with the junior high programs as well. Prior to Boyertown, he was a 3 year varsity wrestler at West Chester University. Congratulations to all four of the newest members of the Boyertown Wrestling Hall of Fame! In their final action of the 2018 calendar year, middle schools East and West headed up to King's College in Wilkes-Barre for the Hawkeye Memorial Tournament. East placed 7th in the 24-team field while West claimed the 16th spot. East came home with 10 medals for placing in the top eight of their weight with West bringing home an additional nine medals. 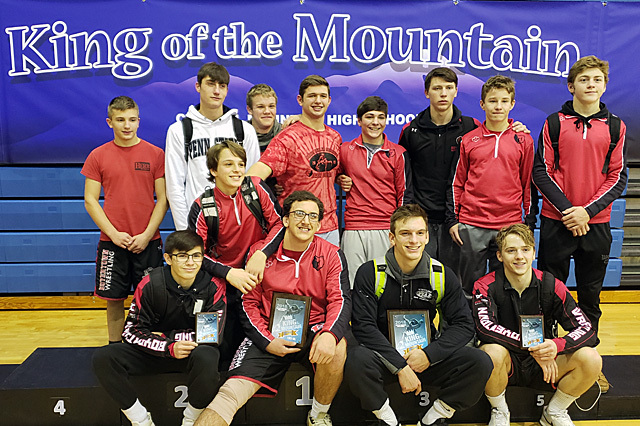 The Bears were one of 32 teams that descended onto Central Mountain HS this past weekend for the annual King of the Mountain tournament. When the dust settled, four Bears earned a top 8 finish and the team finished in 17th place with 78 points. Senior Jacob Miller (195) led the way by going 3-1 to place second. Miller got to the finals with a pin and two decisions before medically forfeiting the finals match. Junior Evan Mortimer (160) placed fourth, going 3-2. Sophomore Julien Maldonado (106) took 6th after earning a spot in the semifinals and went 3-3 for the tournament. Senior Brett Breidor (152) placed eighth with a record of 4-3. The 2018-19 scholastic wrestling season officially got underway this past weekend and for the 15th season in a row, the Bears opened at home with the Brian Bealer Memorial Bear Duals. The Bears went 4-1 on the day and placed 3rd in the 10 team field. In the pool rounds, the Bears went 3-1 with their lone loss to eventual tournament champion Bethlehem Liberty out of District 11. They started the day with a 61-12 win over Interboro and followed up with a 55-20 victory over Harry S. Truman. After falling to Liberty 43-23 (the 23 points was the most Liberty gave up all day), the team rebounded with a 56-15 win over Governor Mifflin to setup a 3rd place match with Garnet Valley. The Bears beat GV 39-33 to take third. Six Boyertown wrestlers finished the day with perfect 5-0 records: seniors Brett Breidor, Jacob Miller, and Jacob Sonder, junior Evan Mortimer, sophomore Julien Maldonado, and freshmen Chance Babb. Going 4-1 on the day was freshman Kade Davidheiser while freshman Alan Alexander and sophomore Jimmy Sinclair each were 3-1 on the day.